The International Union of Pure and Applied Chemistry publishes many books, which contain its complete list of definitions. The definitions are divided into seven "colour books": Gold, Green, Blue, Purple, Orange, White, and Red. There is also an eighth book—the "Silver Book". Nomenclature of Organic Chemistry, commonly referred to by chemists as the Blue Book, is a collection of recommendations on organic chemical nomenclature published at irregular intervals by the International Union of Pure and Applied Chemistry (IUPAC). A full edition was published in 1979, an abridged and updated version of which was published in 1993 as A Guide to IUPAC Nomenclature of Organic Compounds. Both of these are now out-of-print in their paper versions, but are available free of charge in electronic versions. After the release of a draft version for public comment in 2004 and the publication of several revised sections in the journal Pure and Applied Chemistry, a fully revised version was published in print in 2013. The front cover of the second edition of the Compendium of Chemical Terminology. The Compendium of Chemical Terminology is a book published by the International Union of Pure and Applied Chemistry (IUPAC) containing internationally accepted definitions for terms in chemistry. Work on the first edition was initiated by Victor Gold, thus spawning its informal name: the Gold Book. The first edition was published in 1987 (ISBN 0-63201-765-1) and the second edition (ISBN 0-86542-684-8), edited by A. D. McNaught and A. Wilkinson, was published in 1997. A slightly expanded version of the Gold Book is also freely searchable online. Translations have also been published in French, Spanish and Polish. Quantities, Units and Symbols in Physical Chemistry, commonly known as the Green Book, is a compilation of terms and symbols widely used in the field of physical chemistry. It also includes a table of physical constants, tables listing the properties of elementary particles, chemical elements, and nuclides, and information about conversion factors that are commonly used in physical chemistry. The most recent edition is the third edition (ISBN 978-0-85404-433-7), originally published by IUPAC in 2007. A second printing of the third edition was released in 2008; this printing made several minor revisions to the 2007 text. A third printing of the third edition was released in 2011. The text of the third printing is identical to that of the second printing. The Compendium of Analytical Nomenclature is a book published by the International Union of Pure and Applied Chemistry (IUPAC) containing internationally accepted definitions for terms in analytical chemistry. It has traditionally been published in an orange cover, hence its informal name, the Orange Book. Although the book is described as the "Definitive Rules", there have been three editions published; the first in 1978 (ISBN 0-08022-008-8), the second in 1987 (ISBN 0-63201-907-7) and the third in 1998 (ISBN 0-86542-615-5). The third edition is also available online. A Catalan translation has also been published (1987, ISBN 84-7283-121-3). The first edition of the Compendium of Macromolecular Terminology and Nomenclature, known as the Purple Book, was published in 1991. It is about the nomenclature of polymers. The second and latest edition was published in December 2008 and is also available for download. Nomenclature of Inorganic Chemistry, by chemists commonly referred to as the Red Book, is a collection of recommendations on inorganic chemical nomenclature. It is published at irregular intervals by the International Union of Pure and Applied Chemistry (IUPAC). The last full edition was published in 2005, in both paper and electronic versions. The Biochemical Nomenclature and Related Documents (1992) or White Book contains definitions pertaining to biochemical research compiled jointly by IUPAC and the International Union of Biochemistry and Molecular Biology. 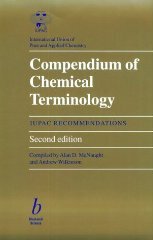 ^ "Nomenclature and Terminology (including IUPAC color books)". ^ Rigaudy, J.; Klesney, S. P., eds. (1979). Nomenclature of Organic Chemistry. IUPAC/Pergamon Press. ISBN 0-08022-3699. ^ Panico R, Powell WH, Richer JC, eds. (1993). A Guide to IUPAC Nomenclature of Organic Compounds. IUPAC/Blackwell Science. ISBN 0-632-03488-2. ^ Preferred names in the nomenclature of organic compounds, International Union of Pure and Applied Chemistry, archived from the original on 2009-12-19, retrieved 2009-11-22 . ^ IUPAC Chemical Nomenclature and Structure Representation Division (2013). Favre, Henri A.; Powell, Warren H. (eds.). Nomenclature of Organic Chemistry: IUPAC Recommendations and Preferred Names 2013. IUPAC–RSC. ISBN 978-0-85404-182-4. ^ Nomenclature of inorganic chemistry; issued by the Commission on the Nomenclature of Inorganic Chemistry [of the] International Union of Pure and Applied Chemistry. Butterworths. 1971. ISBN 9780408701686.